Tennis 4A State Champions! Boys doubles team, Karch Knoll and Ethan Marsh, won boys doubles state championship. James Merchant won second place in boys singles. Vanguard wins boys 4A TAPPS Team State Championship! Great Job to our entire Team and wonderful coach! 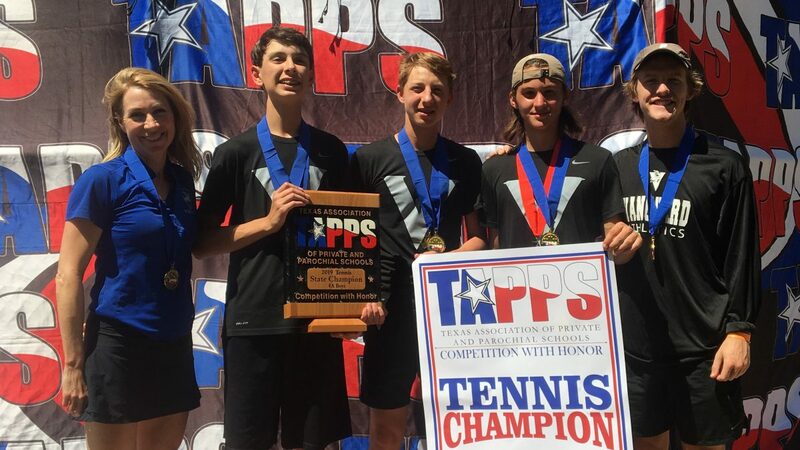 For the last two years, Vanguard College Preparatory School’s Boys Team were runners up in the TAPPS 4A State Championship. Last year, they missed it by one point. This year the hope was things were going to be different. Vanguard qualified 7 players, three doubles teams and one singles player. Two of the doubles and one of the singles players were from the boys’ team. In girls doubles, Courtney Wiethorn and Rachel Merchant qualified for the state tournament for Vanguard, the first girls to make qualify in a number of years. The team lost in a close super tie-breaker for the third in the first round to the #3 seeds. In boys’ singles, Sophomore James Merchant won his first and second rounds 6-0, 6-2 and 6-1, 6-0. If the semifinals he battled in three sets to beat Charlie Micheals from Tyler All Saints, who came down from TAPPS Class 5A, going 6-0, 7-6, 6-3. In the finals, James lost to Ben Kiblinger, Tournament Champion, also of All Saints, 1-6, 1-6. In boys doubles, Langston Wade and Adrian Northcutt of Vanguard lost to the #1 seeds from Boerne Geneva in the first round. Vanguard’s other doubles team, Karch Knoll and Ethan Marsh, dominated doubles in the tournament, with a first-round win of 6-1, 6-1, second round win at 6-1, 6-1, and a semi-final win of 6-0, 6-1. The team defeated Luke and Stephen Moore of Arlington Grace Prep 6-1, 6-4 in the finals. The wins resulted in Vanguard winning the State 4A Boys’ Doubles Championship, placing second in the State 4A Boys’ Singles, and winning the State 4A Boys’ Team Championship. 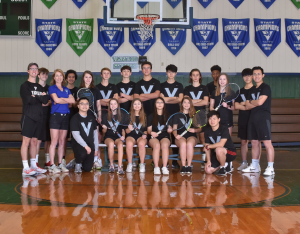 Congrats to the Vanguard Tennis Program on an outstanding season!